The costs involved in car maintenance and repairs aren’t always pocket-friendly. If you are familiar with how cars work or are knowledgeable about car repairs, then you probably don’t need a professional mechanic for several routine tasks, like oil changes or certain replacements. However, even if you are very well versed with car care, there are certain repairs which should be left to a professional mechanic. The brake system of your car consists of several components. Each of these can face wear and tear or damage due to bad roads, bad driving habits, or from a fault which develops from one component impacting another. In the normal course of driving your car, various parts of the braking system; including the brake pads, brake drums, brake lines, or the brake rotors and calipers will sustain damage and they’ll need to be replaced. The good news is – the replacements are not pocket breakers and their replacement is an easy enough job. Since the braking system involves your safety and the safety of your car, this is one repair job which is best done by a professional mechanic. If you are regimented about servicing your car on a routine basis, you shouldn’t face any serious transmission issues. However, as mentioned above, sometimes you cannot avoid certain parts sustaining damage. Fluid leaks, the clutch getting jammed, or torque converter issues are common transmission problems which affect the running of your car. A proper professional assessment of the triggers is necessary when it comes to transmission problems since some of the parts are located under the hood of your car – an area that is not easily accessible at a home garage. The repair work might involve either repairing the damaged part or replacing it; both should be left in the capable hands of a certified mechanic. The suspension system is a complex structure comprised of different components; including coil springs, struts, and shocks. If your car has an air suspension system, then that comes with its own set of unique complexities. For this reason – any repair work or replacement job that needs to be performed should be carried out by a professional car technician. 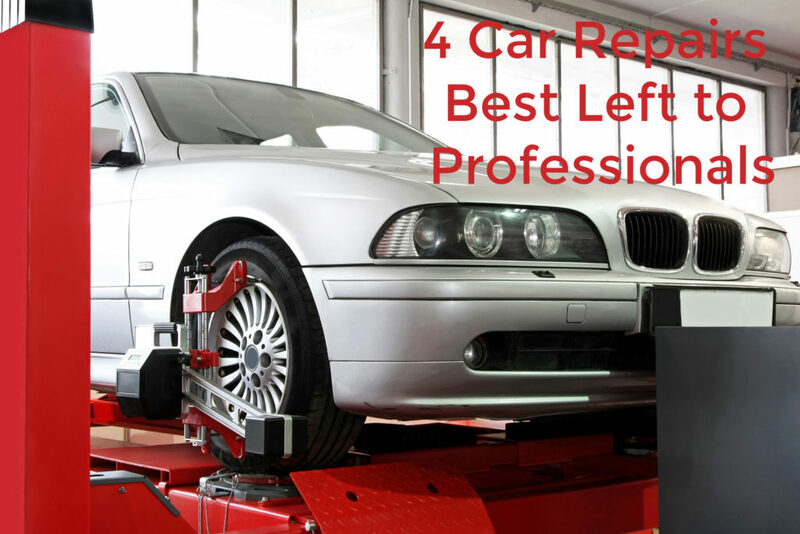 Even if you are well versed with car repairs, to do any kind of repair work or to even assess a problem, you will require equipment to hoist the car up first – only a car service center or someone who has a well-equipped garage has access to that kind of equipment. The problem could be with the oxygen sensors, the exhaust pipes or headers, or it could be due to a faulty catalytic converter. Without a professional assessment, identifying the exact cause behind the faulty exhaust is difficult. This is another car repair job that should be done by a professional mechanic. Any kind of tinkering without the proper knowledge and the right tools could lead to greater damage to your car and could even lead to personal injury. Engine trouble – especially if the check engine light flashes on and you are unable to locate the trigger. Electrical trouble (power windows and locks not working). Extensive damage to the car body. Repair and replacement of the windshield.